By Abby N. Altman, Ph.D. When interviewing for graduate school I frequently answered the question, “Why counseling psychology and not clinical psychology?” Given my doubts about what the interviewers were looking for in a response, and uncertainty about my interests and fit within the field of psychology, I struggled with a reply. In my graduate program, I was unique among my peers in that I desired hospital placements and older adult experiences (vs. college counseling centers). Due to this distinctiveness, the “why counseling psychology?” question emerged again during internship interviews. At this time, I felt more prepared and confident with my reply. My appreciation had grown for what counseling psychology had to offer, including its tenants of practicing cultural sensitivity and facilitating personal and interpersonal functioning across the life span. This fully resonated with my conceptualization of individuals and their struggles. I appreciate counseling psychology for its encouragement of critical thinking, including thinking about how multiculturalism is understood and identified. During my diversity training, I found age to be a unique variable; this was something I explored clinically and in my research. What always stood out was how we are not born into being “old”, but we grow into it. Aging is universally experienced, but in many ways not fully understood. At times, people avoid the topic of aging in discussion or self-reflection, given some of the negative impressions they have about it. As Kelly Martincin stated in her blog entry about greeting cards as potential microaggressions, jokes about getting old are a regular part of conversation. Also, they represent one way we relate to aging milestones. Similar to last month’s blog entry, also penned by Kelly Martincin, how could we be culturally sensitive to a variable that is inconsistently included in personal and clinical conceptualizations of multiculturalism? People no longer ask me, “Why counseling psychology?” Rather, people now ask, “Why older adults?” When answering, I frequently reflect on my journey. I see geropsychology as the “little engine that could.” It is growing in speed, but it has not quite arrived. More programs have Geropsychology tracks; and, there are graduate programs and fellowships in Geropsychology. 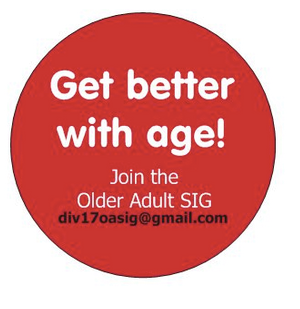 There are also opportunities for re-specialization and mentorship, including the Division 17 OA-SIG mentorship program. For more information about the traditional mentorship program that links students with mentors, contact Aarika White at draarikawhite@gmail.com. For more information about the mentorship program focused on professionals who are re-specializing in Geropsychology, contact me at analtman@partners.org. I do not mind people asking questions about my career choices, including the sub-field and the population with whom I choose to work. By asking these questions, it tells me that people are curious about what they do not know. And, they want to learn more about working with folks across the lifespan. I am excited by that- it helps “the little geropsychology engine that could” travel a bit closer to the station. Dr. Abby Altman is a licensed psychologist and geropsychologist currently working as an Associate Psychologist and Associate Director of Psychology Education at Brigham and Women’s Hospital- Department of Psychiatry. She is a full-time clinician in the Cognitive Behavioral Therapy (CBT) program and is the co-director of the Brigham Psychiatric Specialties’ Geriatric clinic. She is appointed at the level of Instructor at Harvard Medical School. This entry was posted in Uncategorized on February 5, 2016 by div17oasig.